At least 84 people were killed in a deadly attack Thursday when a truck driver purposefully plowed into a large crowd gathered to celebrate Bastille Day in the French Riviera city of Nice. 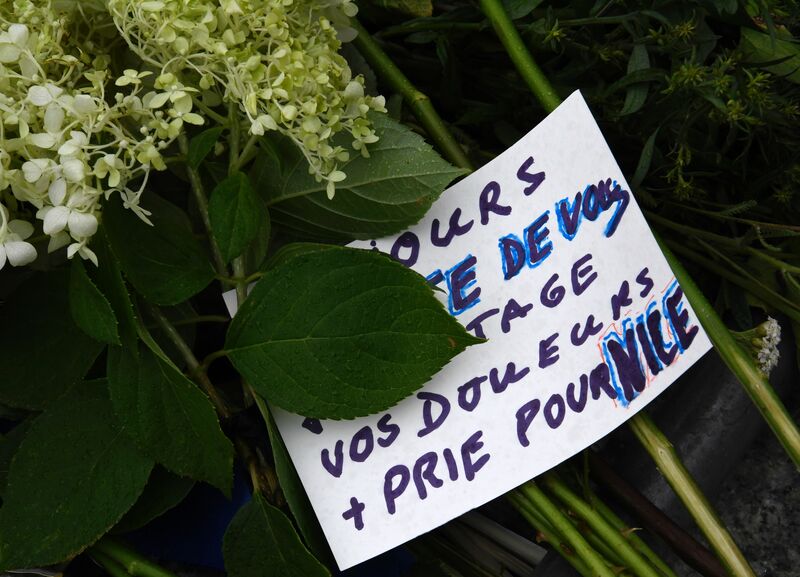 On Saturday morning, ISIS took responsibility for the Nice attack, and tributes to Nice attack victims have cropped up worldwide as the country mourns. From London to San Francisco to Sydney to Moscow, cities around the globe showed their solidarity and support for Nice through a variety of memorials and vigils. The events of the attack itself were horrific: A driver careened into a crowd of people gathered along Nice's famed Promenade des Anglais to watch Bastille Day fireworks late Thursday, driving for more than a mile before police shot and killed him, according to the BBC. French prosecutor François Molins told CNN police had reportedly found replica firearms inside the cab of the truck. Some 202 people were injured in the attack. To honor those killed in the attack in Nice, buildings in Brisbane, Dallas, Mexico City, New York City, San Francisco, and Riyadh were lit up in the colors of the French flag while flags were flown at half-mast in Scotland, England, Belgium, and Germany as a sign of respect and mourning. Candlelight vigils were held in Amritsar and Sydney late Thursday with impromptu memorials comprised of candles and flowers left at French Embassies in London and Moscow. In California, San Francisco's city hall was illuminated Thursday night with the blue, white, and red of the French tri-color flag in a visual nod of solidarity with France. French nationals living in the city gathered outside the French consulate for a small candlelight vigil. Buildings in New York City and Dallas were also lit up to honor those killed in Nice. The colors of the French flag illuminated landmarks in the Australian cities of Brisbane, Melbourne, and Adelaide. In Mexico City, the Senate building was spotlit with the blue, white, and red of the French flag. The city of Belfast in Northern Ireland will also light up its city hall in the colors of the French flag after the sun sets Friday, according to a local paper. The Californian city of Palm Springs will also illuminate a building in honor of France. Memorials were established outside French diplomatic buildings in Moscow, London, and Berlin as locals and French nationals living abroad moved to show their solidarity and support following the deadly attack. In Sydney, Australia, and Amritsar, India, residents gathered for candlelight vigils. The European Parliament building in Brussels, Belgium, projected Je Suis Nice onto its facade in a tribute to the victims of the Nice attack. At Friday's meeting of the United Nations Security Council, a minute of silence was held to honor those killed Thursday in France. Cities across the world have extended their support to France through a variety of heartfelt tributes and memorials following Thursday's fatal attack in Nice in an international show of solidarity.